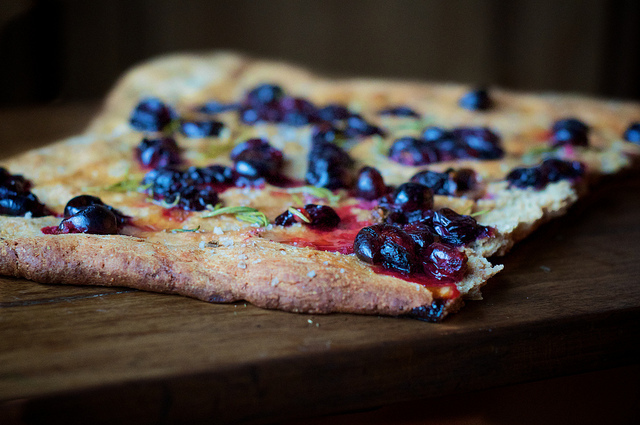 Sourdough focaccia with grapes, fresh rosemary and coarse sea salt found its way to our kitchen last week. Loosely adapted from the classic Italian grape bread or schiacciata con l’uva, this sourdough focaccia with grapes and rosemary takes an even more rustic approach – omitting enrichment by egg and sugar in favor of only the most basic of ingredients: levain or sourdough starter, whole grain flour, grapes, rosemary, coarse and chunky unrefined sea salt – all doused by a heavy application of full-bodied and fruity unrefined extra virgin olive oil (see sources for my preferred producer). I like working with sourdough. It’s a wild food – unruly and unpredictable. For many cooks, it takes a special rigor to tame the beast – coaxing the wild bacteria and yeasts from the air, feeding them gently on freshly milled flour and clean water, training them to bubble, rise and fall. Tending a levain or sourdough starter is an ancient rite, a lost art, having fallen from favor once bakers yeast was introduced to the French courts in the latter half of the 17th century. Now don’t get me wrong, I love a slow-risen yeasted bread too, but it can share no comparison with a true, honest-to-goodness sourdough whose character far supersedes the bland nature of a yeasted bread. And in this focaccia, where the ingredients are few but magnificently intense, sourdough proved the only sound choice. If you’re new to sourdough baking and want to tend a levain, you certainly can catch wild yeasts with a mixture of flour and water, but I recommend using a starter culture (see sources) to inoculate your flour ensuring more reliable results. Sourdough focaccia with grapes, as with any soured bread, offers more than just improved flavor over its yeasted counterparts, but also an dramatic increase in the quantity of vitamins coupled with an increase in the bioavailability of trace minerals. All grains, and nuts and seeds, too, harbor anti-nutrients in their germ including phytic acid and enzyme inhibitors. Together, these anti-nutrients make grains difficult to digest and bind up minerals like zinc and iron naturally found in grain, preventing their full absorption. For many people, omitting grains from the diet entirely and adhering to a grain free diet proves the best course of action; for everyone else, it is essential that they learn to prepare grains properly to mitigate the effects of naturally occurring anti-nutrients and improve the nutritional quality of the grains and flours they consume, if they bother to eat them at all. In our version of schiacciata con l’uva, we top sourdough focaccia with grapes, rosemary, coarse sea salt and unrefined extra virgin olive oil. A heavy sprinkling of coarsely ground black pepper doesn’t hurt either, I might add. Concord grapes, though an American varietal, prove a near-perfect choice for this classic bread which typically uses grape wines. The Concord grape, peppery and almost foxy in its finish, is a magical and transformational fruit. Intensely grapey in flavor with its thick and deep-hued purple skin and a pale green interior, the Concord grape outshines the characterless red and green table grapes you typically find in the produce section of your supermarket. It’s a small, round grape that rolls along your tongue, and, like any overbearing mother, the Concord grape is not one to yield her seeds easily; she fiercely grips them and it takes some effort to first pierce the grape’s skin and then wield the seeds from her tart, green flesh. Want to learn more about the benefits of sourdough baking? Check out this online cooking class focused entirely on preparing healthy whole grains through soaking, sprouting or sourdough fermentation. After it has doubled in bulk, roll the dough into a rectangle about ¾-inch thick. It is now ready for the grapes, rosemary and other toppings. I made this last night and absolutely loved it! Since the cool fall air has set in for me and I couldn’t resist flinging all the windows open, I needed to use a longer rise time. I think this resulted in the bread being slightly more sour, but it was a welcomed flavor addition. You are right, Concord grapes truly are perfect on this bread. Thanks for sharing! I will definitely be repeating this.